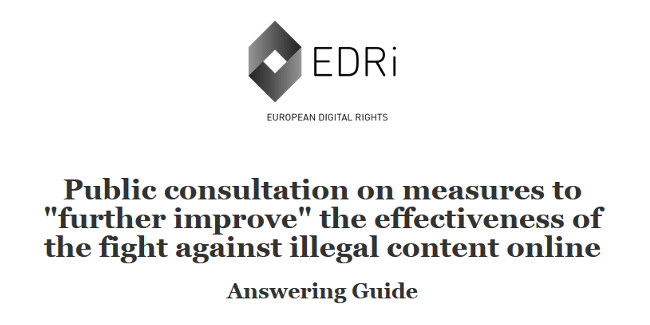 EDRi Answering Guide to EU Commission's illegal content "consultation"
Responding should take about 15 to 20 minutes and could have a long-lasting impact on anti-racism, hate speech, child protection, counter-terrorism, freedom of expression, privacy, among other important topics, in Europe. The consultation follows increasingly frequent demands from the European Commission for arbitrary, unaccountable policing of the internet by service providers, including a Communication in September 2017 and a Recommendation in March 2018. Now, France and Germany are demanding legislation to impose still further restrictions – in the total absence of any evidence that this is necessary, proportionate… or even that it wouldn’t be counterproductive. Techdirt, provided some good background on the consultation in an article entitled “EU Commission asks public to weigh in on survey about just how much they want the Internet to be censored”. Click below to access the guide. Each response counts – please play your part. *We would prefer to use frames to make it easier to see both the consultation and the guide at the same time. This is currently not possible due to the way the consultation is coded. We have asked the Commission to change this.